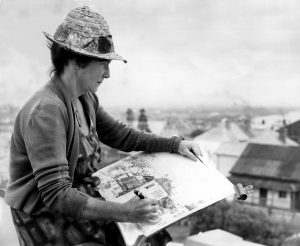 Margaret Olley: Life’s Journey introduced audiences to an aspect of the artists work that has rarely been exhibited and is little known. Famed for her impressionistic paintings of interiors and still lives, this exhibition places in the centre stage the pen and ink watercolour sketches and monotypes, she executed from the late 1940s to the early 1970s. 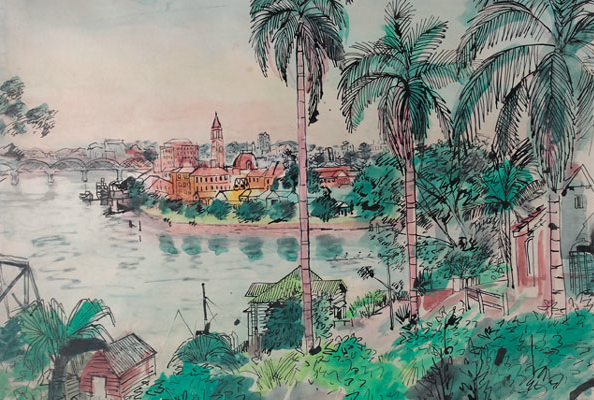 Margeret Olley: Life’s Journey grew out of a group of artworks held in the collection of the University of Queensland, that included sketches of France, Hill End and New Guinea. This exhibtion was curated by Michele Helmrich and Nick Mitzevich, in association with the University of Queensland. The exhibition toured from the University of Queensland Art Museum, to the S. H. Ervin Gallery, and then to the Newcastle Regional Art Gallery. Colour catalogue published by the Univerity of Queesnland accompanied the exhibition. UQ Art and Radio National: feature on Margaret Olley, to celebrate her ‘Life’s Journey’ exhibition at UQ Art Museum 6 February-9 April 2009.